Dream: To engage in activities that will ensure the continued survival of sea otters. Susan Campbell has been working for the past two decades to save one of California's most loveable yet endangered wild creatures: the sea otters. Campbell is an ocean lover and experienced diver, and the sea has become a second home for her, the place where she can share her own knowledge with orphaned otters in need. In ADVENTURES IN WILD CALIFORNIA, Susan Campbell offers a rare glimpse of interspecies communication far from the shores of human experience. Campbell has worked at the renowned Monterey Bay Aquarium since 1990, where she rehabilitates orphaned and injured sea otters for return to the wild; tracks rehabilitated animals in the sea; helps to design sea otter holding pools and provides temporary care for otters; and oversees the training of staff and volunteers. She previously assisted with the care and rehabilitation of oiled northern sea otters at the Sea Otter Rescue and Rehabilitation Center in Seward, Alaska and worked as a biological aid for the U.S. Fish and Wildlife Service, transporting otters for a translocation project. 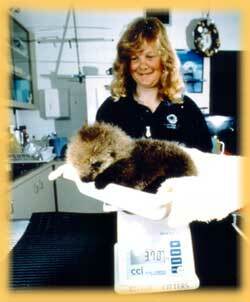 Campbell's other wild pursuits include working as a Veterinary Assistant in Monterey, California. Q: What role do sea otters play in wild California? A: Sea otters in my mind are kind of the canaries in the coal mine. As their population slowly declines, it might be a sign of something going wrong in their California habitat and ultimately in our California habitat. I hope that by meeting these otter pups a little bit of that message will come across to audiences. These guys are threatened and they could very well become a new addition to the endangered species list. We've been studying sea otter carcasses trying to figure out what is causing their deaths, but it's still a mystery. We hope when we figure it out it will teach us a lot. Q: What is the best part of working with sea otters? A: There are two things: one of them is just knowing that some of them are still out there living and knowing that without our program they would die. They're getting a second chance - and to be a part of that is a wonderful feeling. The second thing is being able to swim with sea otters in their own world, which is an incredible experience that gives you a new perspective. The most important thing you realize is that it's really hard to be a sea otter - and humans aren't very good at it! Q: What is the future of wild California? A: I don't know the future but I have a hope. My hope is that we can figure out some of the things that are causing problems for California wilderness and that we can heal those problems. My hope is that we can make a much more healthy environment not only for sea-otters but for the whole eco-system out there in the oceans. Troy Hartman is a true California adventurer who thrives on risk and dances at the very edges of what is humanly possible. A pilot, parachutist, downhill ski racer, rock climber, snowboarder and renowned skysurfer, Hartman takes to the air in almost every natural environment California provides. 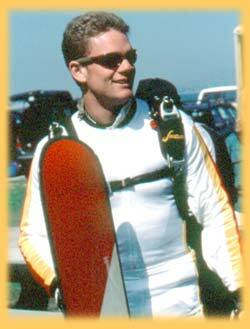 Hartman is a world champion skysurfer with more than 4,000 jumps to his credit. He has taken first place medals at the ESPN "X-Games, on the "X-Trials Pro Tour" and on the "Destination Extreme Pro Tour." His stunts have been seen in motion pictures and television including the wind tunnel sequence in "Batman and Robin" and skysurfing on "Baywatch," as well as in commercials for Pepsi, Mountain Dew, Coca-Cola and Chevrolet. He has also been featured on the news show "Dateline" on a feature about extreme personalities, on the Discovery Channel documentary "Go For It: Big Air" and in several music videos. The Mammoth Lakes native is now the host of a new MTV show entitled "Senseless Acts of Video" which explains the behind-the-scenes tricks behind some of music video's most amazing stunts. Like many Californians, Joe Jennings is in the movie business. But he does most of his work above 10,000 feet. Jennings' specialty is skydiving cinematography and still photography. His work has been widely seen in such films as "Airforce One" and on television for such shows as MTV Sports, ESPN, Discovery Channel, CNN, "Dateline NBC," "Hard Copy," "The Pretender," "Current Affair," "Bay Watch," "Conan O'Brian," "Amazing People" and many more. 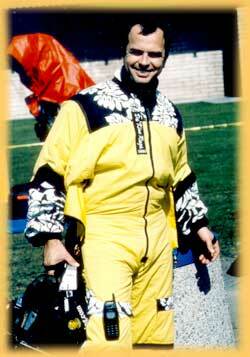 When former President George Bush went skydiving, Jennings was there. He has garnered two Emmy Awards for MTV's "Drop Zone" special and ESPN's "Extreme Games" as well as awards at the Gravity Sports Film Festival. His commercial work is extensive including such well-known spots as "Air Delivery," which featured a mid-air pizza delivery, as well as national ads for Pepsi, Mountain Dew, Levis, Dr. Pepper, VISA, MCI, Budweiser, Pentium II, Blue Cross Blue Shield and Infiniti. His Pepsi "Goose" commercial was voted the number one Super Bowl Commercial of 1998 and also was honored with a Clio. Jennings' still photography has been published in outlets ranging from USA Today and California Magazine to Skydiving and Outdoor Magazine. In addition to his accomplishments as an aerial cinematographer, Jennings is a champion skysurfer. He is currently at work on a new documentary that features the best footage of his career, including flying cars, skydiving at the Arctic Circle, and lots of unusual skysurfing. Q: What does "Wild California" mean to you? A: Wild California for me means wonderful photographic opportunities all the time. It means a positive atmosphere and a visually stunning environment. It means more clear skies and more opportunities to jump. I live here because I'm not shut down in the winter and I can fly anytime in spectacular landscapes. I grew up on the East Coast but I always used to dream about going to California - as soon as I was old enough I packed a duffel bag and got here as soon as I could. Q: What is the best part about being a skysurfing cinematographer? A: I love flying the camera and filming almost more than I love jumping itself. I love exposing film and seeing beautiful backdrops and chasing the action. You almost feel like a human jet when you're out there flying aggressively, trying to get to your target. And what I like even more about is seeing the incredible footage later and editing it into a real adventure for people who might not have a chance to skydive. I'm stunned and gratified to find myself doing something this wild for a living. A: I think it will be just fine if people take care of it. People need to recognize that we have an incredible resource right here and remember that we should try to leave it for our children and future generations. Q: What does large-format adventure mean to you? A: What I love about the IMAX format is that the audience really does get to feel like they're up there. I shoot a lot of formats and always try to give people a 3D ride, but IMAX is wonderful because if the camera is there it's almost like the audience is there, too. A native of California, Jeff Clark was born in Redwood City and moved to Half Moon Bay in 1966, where he has remained ever since becoming a local and international hero by pioneering Maverick's, the surfing spot with California's, and some of the world's, most monstrous waves. Clark first surfed Maverick's in 1975, as a hard-charging 17 year-old, stunned to find hidden 25-foot waves detonating right in his own backyard. For 15 years, he was the secret area's lone surfer, inventing a form of highly committed surfing in which there can be no mistakes - or you pay with your life. As rumors of Clark's monster-wave playground began to spread, so did tales of his extreme bravery and ability. 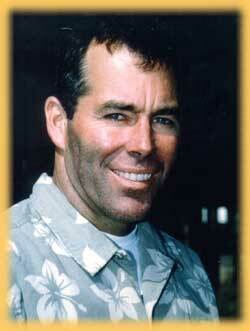 He quickly became one of the most renowned and respected surfers in the world. Jeff Clark is one of surfing's leading innovators in every way. He shapes and designs his own boards, specially engineered to withstand the hard and fast conditions at Maverick's. He is also the Contest Director for the annual surfing competition at Maverick's, one of the premier big-wave contests in the world. Clark is sponsored by Quiksilver, the world's leading boardriding company. When he's not surfing, he's busy raising three children. A: To me, wild California is the part of California that you experience when you step outside your usual experience, when you cross the line and start taking risks. For a lot of people, the wild is only seen through a window, but there are those of us who know no boundaries, who will step out of an airplane or ride a giant wave. I think that is what the film ADVENTURES IN WILD CALIFORNIA depicts: those of us who are driven by adrenaline and by the strong desire for new experiences. Q: What does IMAX photography bring to surfing? A: A 70-foot screen is the only way to do justice to the biggest waves in the world. The thing about Maverick's is that it is so far out in the ocean that views of it are very limited in person. Unless you're there in the water, it's impossible to truly know what it feels like out there. With the IMAX camera, for the first time you can really get a good sense of the power that exists out there. It was really exciting to have MacGillivray Freeman want to capture this. It was a pretty wild shoot - even the cameramen were getting run over by the huge waves. Q: What do love most about surfing at Maverick's? A: I'm driven to play in the power of the ocean and there's so much power at Maverick's that it's that much more fun. When you're out there keeping your mind calm in the midst of all this power, you really begin to see your place in this giant ocean. It's truly a test of your conditioning, ability and expertise. It can be very peaceful like a meditation, but there's also risk, excitement and adrenaline boiling in your veins. It gives you a different perspective. Maverick's is also really unique in that you can ride a wave out there for more than a minute. Most big waves in the world you can only ride for 15 seconds if you're lucky, but Maverick's is such a long point, you can ride for a quarter of a mile. A: For me, it's about the future of the ocean and the bottom line is we have to stop throwing garbage in it. The ocean shouldn't be off limits to those who respect it, but there has to be a balance. My philosophy is that if you live your life as best and clean as you can everything will be all right. Stephen C. Sillett can often be found by looking up, way up, into the canopies of California's forests. As one of California's foremost biological experts on Sequoia trees, his job is a mixture of climbing, exploring, educating and intense scientific research. He has climbed over 250 trees in search of knowledge, seed collection and conservation. Sillett holds a Ph.D. in Botany and Plant Pathology and currently serves as an assistant professor of botany at Humboldt State University. He has published numerous papers on the life and ecology of Redwood and Sequoia forests in scientific journals, as well as co-writing a chapter in the book The Redwood Forest: History, Ecology and Conservation of Coast Redwoods. 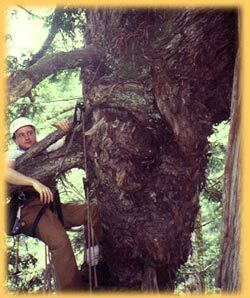 In the field, Sillett has led several tree research expeditions, including a journey inside the 112 meter-tall Mendocino Tree for a Discovery Channel documentary on redwood forests and several rigging and mapping missions inside Redwood National Park. In Oregon, he installed and monitored the first major forest canopy experiments in the Central Cascades and led an expedition for a National Geographic article on forest canopy research. Among Sillett's academic awards are the 1995 William Sterling Sullivant Award for Best Bryophyte Paper; a National Science Foundation Fellowship and the Beinecke Brothers Memorial Scholarship. He is a member of the Ecological Society of America, the American Bryological and Lichenogical Society, Northwest Scientific Association, California Native Plant Society, California Faculty Association and International Canopy Network. Bryan Iguchi is one of America's premier professional snowboarders, one of those rare risk-takers who flows down snow as if he was born to grace. 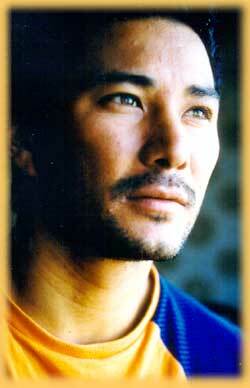 Iguchi is a California native, raised in the San Fernando Valley, where he learned to skateboard and to surf. 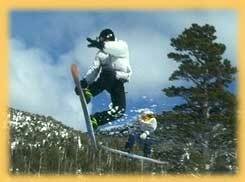 Later he transferred his balance skills to the slopes, falling in love with snowboarding at age 15. He quickly made his way to the snowboard parks of California's Snow Summit, Big Bear, as well as some trips to the Colorado mountains. He joined the Burton Snowboards team in 1992 and quickly made an impact with his riding and image. In snowboarding circles Bryan Iguchi is known simply as "The Guch." He made his name by performing aggressive, technical moves on the International Halfpipe Circuit, nailing many top ten finishes in competition. He has also made his mark on the snowboarding world as a product development consultant to Burton Snowboards, using his intensive knowledge of the snowboarding experience to create better equipment. Iguchi has snowboarded all over the world, has appeared in many snowboarding magazine features, has been spotlighted in several popular snowboarding films and videos and has appeared on MTV's infamous "Big Air" festival. He recently moved to Jackson Hole, Wyoming to explore backcountry snowboarding, traveling by snowmobile to remote areas looking for steep lines and new challenges. During the past six months he has traveled to New Zealand to star in a snowboarding movie (Cinemasoane's "Haakon Faktor"), participated in a promotional tour of Japan and Chile, and managed to get in an early season snowboarding session at Mammoth Mountain in California.